Global access to some of Jewish history's most outstanding literary treasures is now just a mouse click away through JTS Library Treasures, a new online resource of The Library of The Jewish Theological Seminary. 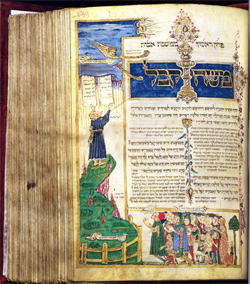 Prepared with the generous support of George Blumenthal of New York City and the extraordinary photographic skills of Ardon Bar Hama of Raanana, Israel, the site features several manuscripts from The Library's exceptional collection, including the Rothschild Mahzor, the Prato Haggadah, and the Esslingen Mahzor, as well as Genizah fragments representing Maimonides and Judah Halevi. Founded in 1893, the Library at JTS is recognized today as the greatest Jewish library in the Western Hemisphere. Its collection includes close to 400,000 volumes, including 25,000 rare books, 12,000 manuscripts, and much more. Among the collection's highlights are its approximately 40,000 fragments from the Cairo Genizah, its collection of kettubot (Jewish wedding contracts), and its unparalleled collection of haggadot (the story of the Jews' exodus from Egypt). The Library is also host to the world's largest collection of Hebrew incunabula, early books, printed before 1501. "The Library recognizes that as important as it is to collect and preserve the literatures and treasures of past, these materials are worth little if they remain eternally on the shelf. Our ultimate goal is to make the cultural heritage of the Jewish people available to the world at large. Current technology, the generosity of George Blumenthal and the talent of Ardon Bar Hama is allowing this to happen," said Dr. David Kraemer, Joseph J. and Dora Abbell Librarian at JTS. As founder and past Chairman of NTL, the largest cable television company in the United Kingdom, Blumenthal came to understand how transformative high speed Internet access could be in sharing the heritage of the Jewish people free of charge. Currently the founder and Chairman of Cellular Communications Inc (Ohio and Michigan), Cellular Communications (Puerto Rico) and Cellular Communications International (Italy), he is responsible, together with Bar Hama for developing a number of educational projects that share the treasures of rare Jewish documents and archeological objects with the world at no charge.